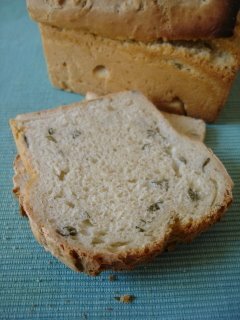 A German friend gave me a great recipe for a very quick home made bread. His original recipe was full of wonderful seeds, but they were too much for someone not so used to it. So I did change a bit, adding more flour and some basil, but you can add any herb you like! Melt the yeast with the sugar and two spoonful of warm water. Let it rest for 10-20 minutes. Add the other ingredients (except those for the topping), and mix well to obtain a thick, but very sticky mixture. Grease a plum-cake mould with some olive oil, pour in the bread mixture and place it in the middle of a cold oven. Turn on the oven at 200° C (392 F), without ventilation, only upper and lower heat, and let it cook for 15 minutes. After that, cut the top of the loaf lengthwise, and let it cook for another 45 minutes. Take the bread out of the oven and let it cool, wrapped in a clean tea towel. Does sound quite yummy. What is Manitoba flour? I haven’t heard of that before. Sounds great! Never heard of Manitoba flour either despite all my years here? Where do I find it??? This basil bread looks great. I’ve gotten several comments from Italian bloggers the past week, I wonder why? It’s interesting to take a look. People often tell me I should do my blogs in English and French but it sounds like a lot of work! @bcifrance: oh yes! It is a lot of work!! !